Well folks - if you thought my Mustang build feature was over the top - this time I thought I'd bring you all along for the journey, I welcome your help, input and critique. By no means do I pretend to be a master modeller, but I'm happy with how my work turns out and turnover on the forums here has been a little slow of late, so I thought I'd bring you all along for the journey. Plus it will keep me honest and force me to spend more time at the workbench. 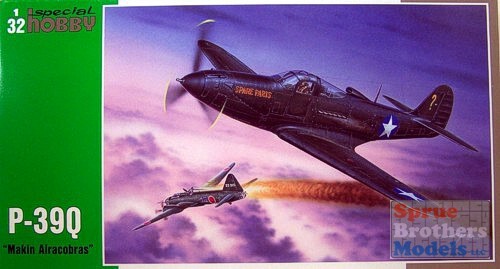 For my next trick I'll be building a PAIR of Special Hobby P-39s. I LOVE this plane and I was ecstatic when this kit was released in my - now favourite - scale....as you can see I got a little carried away. I'm already out of space on the workbench. I have a pair of Big Ed sets, a CMK armament set and many more goodies on the way. I'll be going to Mal Mayfield of Miracle Masks for the markings, and I'll be annoying the hell out of LCarroll and Chukw here on the forums when I inevitably hit some walls and need advice. Stay tuned kids - the build starts tonight! I have one of these in the stash, strapping myself in for this journey! Great thread idea, best of luck with the builds Matt. I don't know that I'd count on me for providing accurate reference Mal lol. I'm using the Detail and Scale publication and as much as I like the series, the walkaround portion of this title is a little lacking - or maybe it isn't, I just wish there was more concrete writing on the differences in the cockpit between the models. I'm operating on the assumption and a small handful of photos that the D and Q cockpits are almost identical. Speaking of preparation, I've been checking FB to see if you're online so I can message you about the two marking schemes I want to have you do up lol. Why don't you live online like the rest of us tools? I'll send you a FB message now. 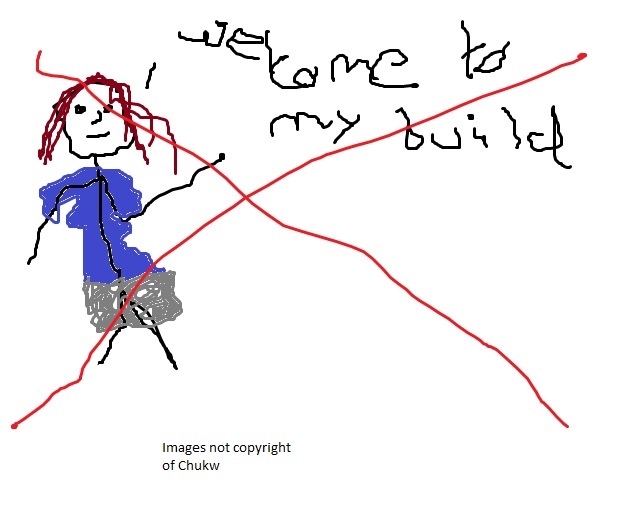 Well - staying true to my word, I did 'start' the build last night, as it were. 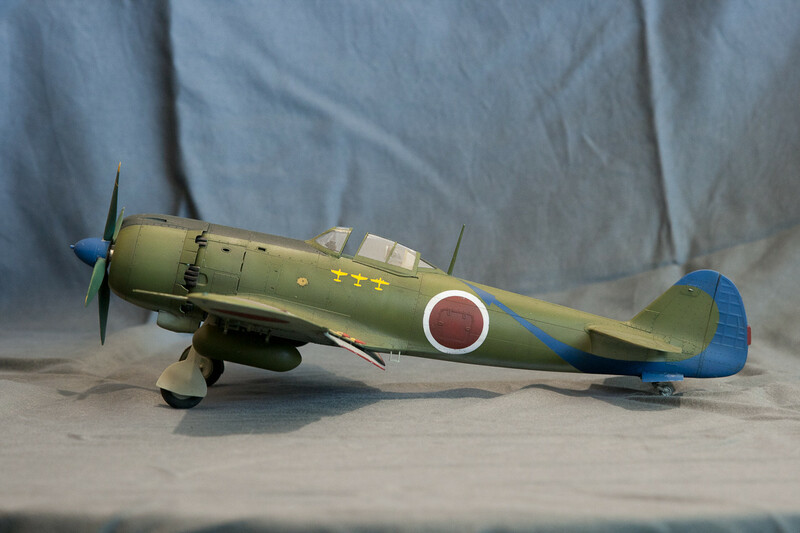 This is a much earlier kit than the Hi-tech release of the P-39Q. I started by comparing the instructions - seems obvious, but I was looking for any differences in the variants that Special Hobby had picked up. The differences line up with the research I did, late model D's are different from the earlier ones, and the Q is similar to the D, but the armament changed again. This is important because at this point I knew I had to compare the fuselages and mark them if they were different. It turns out they're the same, the added nose vents on the Q are molded separately so I needn't be concerned about mixing them up during construction. More importantly I now know that I need to decide on markings for the D variant I'm building so I know whether the model I'm building is a D or a D1. 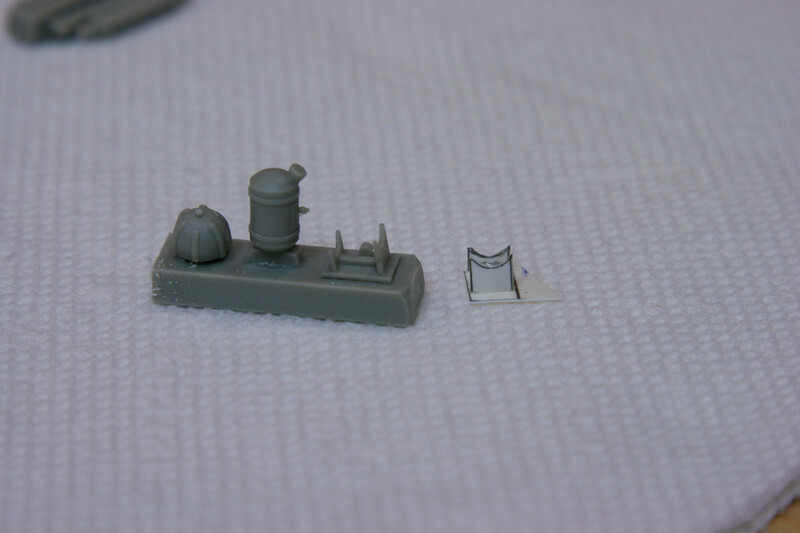 This matters because the CMK set I purchased is their armament set and some digging around shows me that the cannon included is definitely a 37mm cannon. 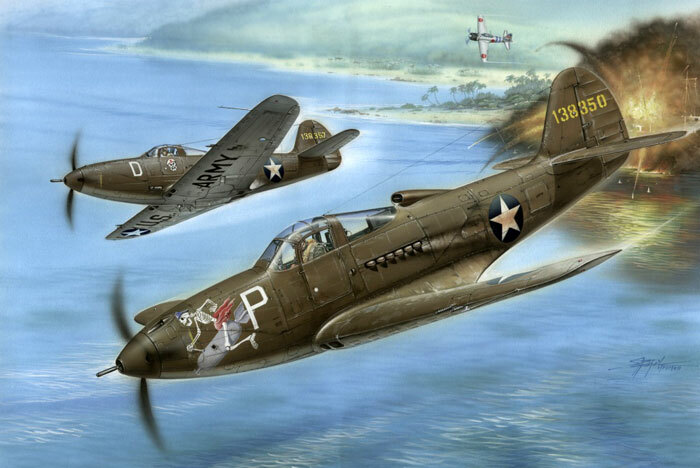 Later model P-39s (ie most of them) were built using a 20mm cannon firing through the hub. They're visually distinguishable by the blast tube, the 37mm is noticeably longer - sticks out further. 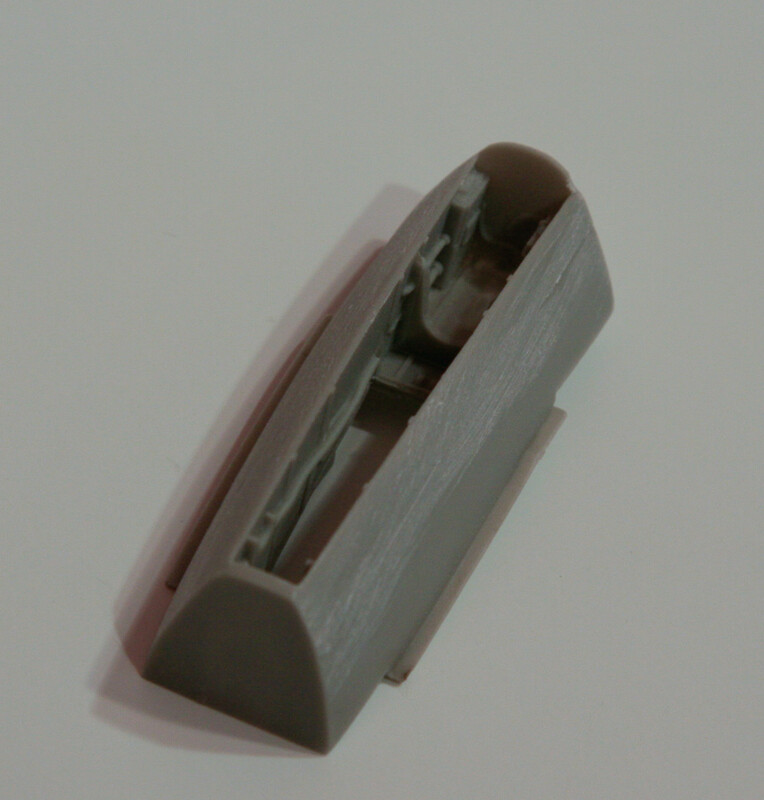 The P-39Q kit is based around the same injection moulding as the D model, but includes a healthy batch of resin, mostly for the cockpit. Both kits have a photoetch sheet included - interestingly they're different. 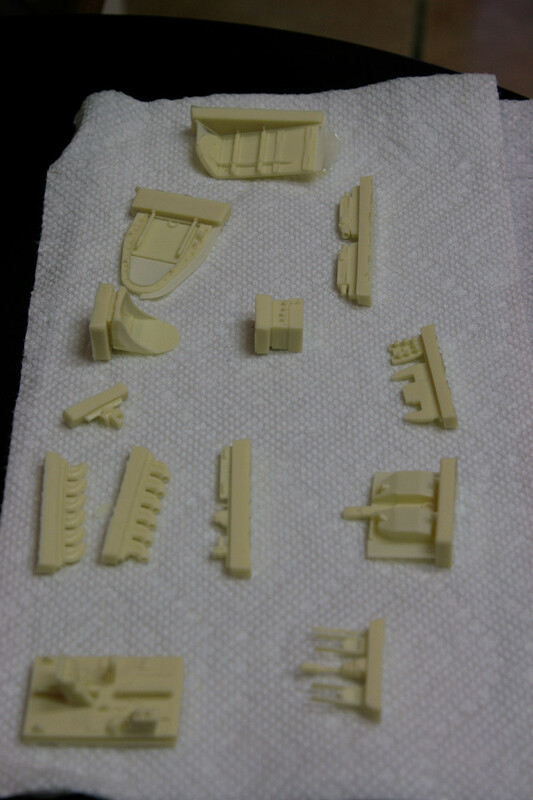 The CMK Nose armament set is primarily resin with a small P/E sheet included. My example has a broken part which I'll be replicating in plastic stock, but otherwise is beautifully molded and the detail is crisp. 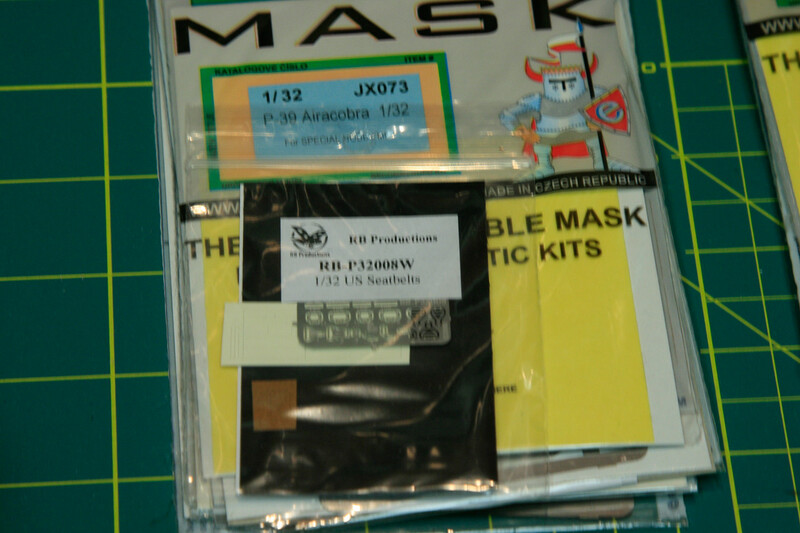 The last step in planning the build at this point was comparing the kit parts, to the CMK parts, to the Eduard sheets. 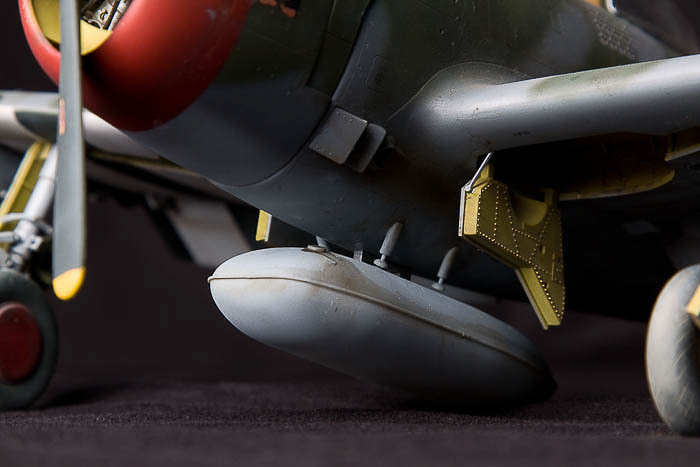 I have decided that for the D model I wont be adding the Eduard detail to the nose wheel bay (this is included in the resin plug for the armament set - photos to follow) as the detail is MOSTLY already in the CMK pieces, and I prefer the depth you get with resin. 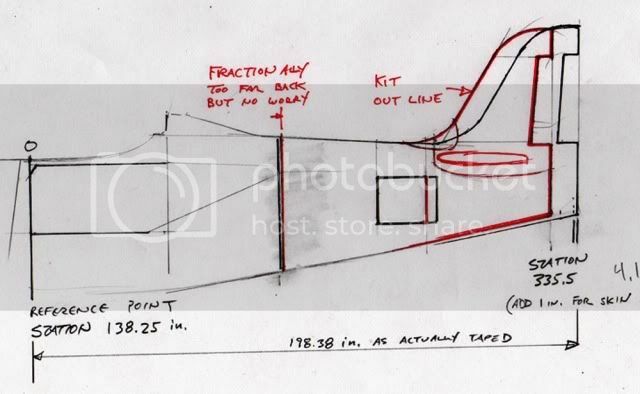 Also, unlike the kit nosewheel which is made up of individual sides, the resin nosewheel bay is one piece and it would prove impossible to get some of the p/e in place AND have it look the part. I finished the night by washing all the parts to remove any traces of the release agent, and set them aside to dry overnight. I'm sorry this was such a long blurb - it's something I'll try to avoid in the future. I will mainly be posting photos from here on out, but I figured a good primer on how to plan a build is always welcome - I always forget to wash my sprues before I start etc, so like everyone else, a good reminder is nice from time to time. I'll be posting some photos of the start this week - the next step will be cleaning up the resin pieces! Matt, Your duel build has certainly caught my eye, and peaked my interest, so I'll be tagging along. I've always had a fascination with the P39, but never really found the time to actually get around to building a few models of the various variants. Looking forward to your next update. Removed by original poster on 08/15/13 - 03:29:46 (GMT). Thanks guys! I hope this build turns out to be as interesting as you expect. For the sake of keeping this thread going - and therefore keeping myself building - I'm posting the first photos. I got some actual time in at the bench today, but before I forget - more goodies! A pair of RB Production Harnesses - one in green and one in white. Having used HGW Harnesses for my Mustang build, the big upside to the RB parts is that they're more easily available - although HGW has an ebay store and to be fair I was amazed how quickly they arrived here. 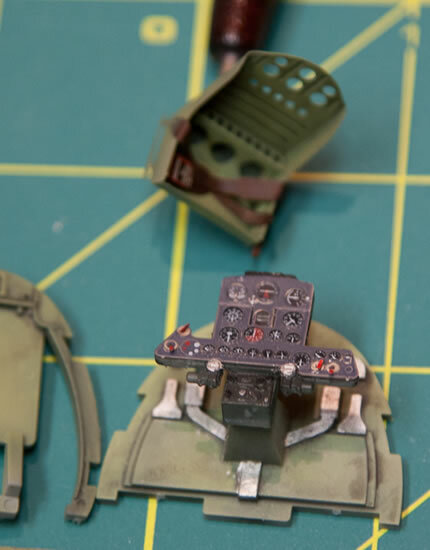 Bigger than that for me though, is the fact that the RB harnesses are pre-cut - the HGW harness you have to cut out yourself (similar to Tamiya's Canopy masks vs. Eduards). I know this is lazy, but for the same price.... Plus on top of that, the HGW instructions are HORRENDOUS. I ended up having to find dozens of photos of the real harnesses to piece together their product. I like both, I would use either, but this time I'm going with a pair of RB items. The goal for the start of this build is to get all of the interior green parts together for priming and painting. I will build both sets alongside each other so it will be interesting to see how the photoetch compares to its resin counterpart. once the green is on then we'll be cookin! 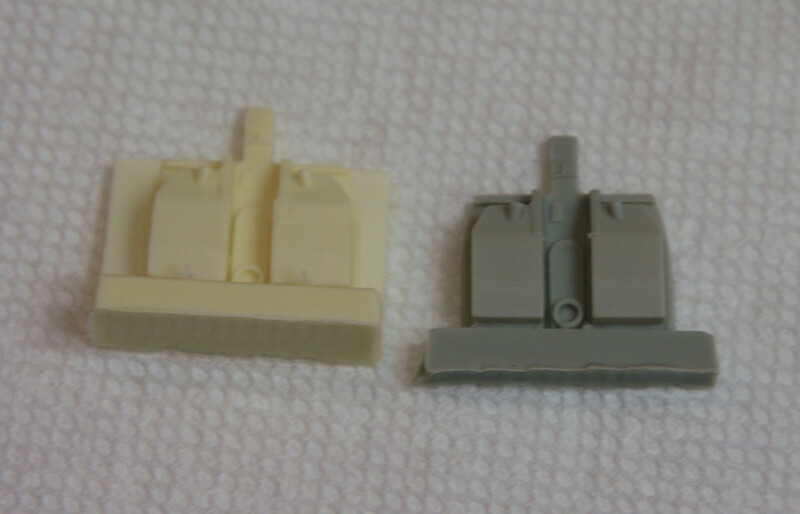 None of these resin pieces are in the 32002 offering, but all of the injection molded pieces are included in both. HAd I known, I would have simply purchased two Q model kits and built one as a D. The upside is that with all the aftermarket going into these two kits, I have a third set of all of these pieces for when something inevitably gets screwed up. 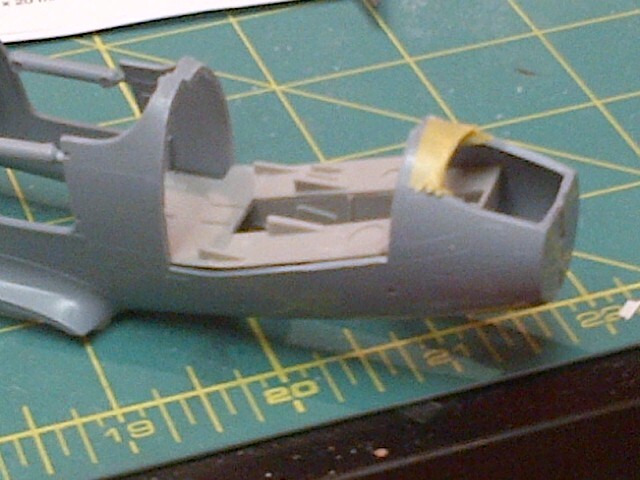 I started the build by separating the nose gear bay/armament bay from it's casting block. 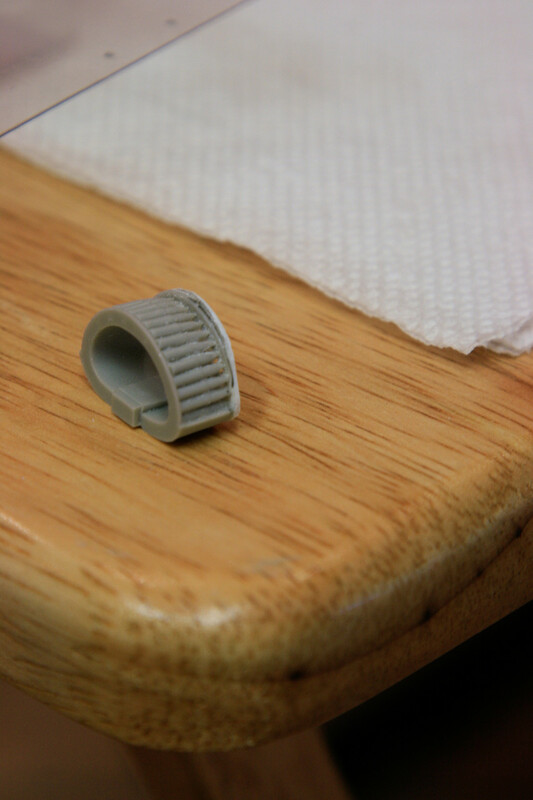 All of the grey resin pieces you see in this build article are from the CMK set. In that photo you can also see the ammunition rack for the 37mm Cannon. I'm working with Mal of Miracle Masks to get a set of masks completed for an early model D. This is important because only the earliest of D models actually carried the 37mm cannon. If we didn't have the luxury of choosing our own markings these days, I'd be in a pickle trying to source a 20mm cannon for the nose AND redoing this ammo rack to reflect the smaller caliber. 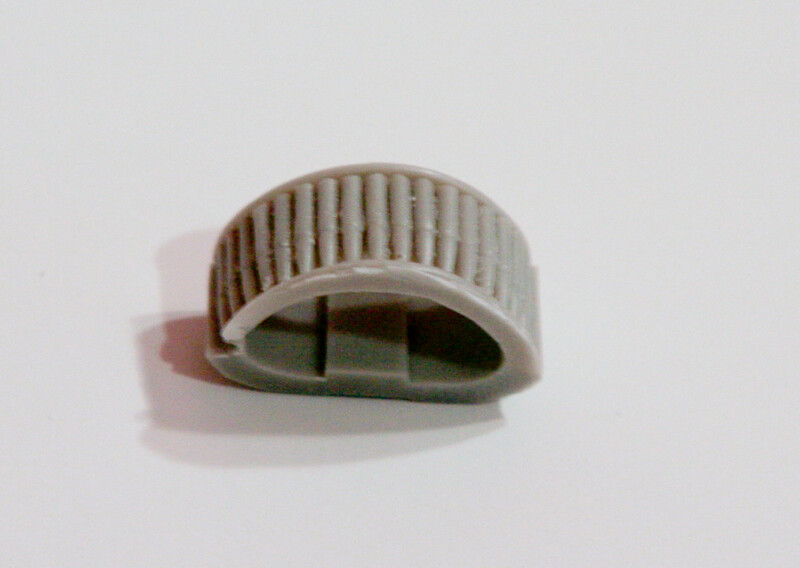 What you dont see in that photo is that the casting I received is thin and where the wheel retracts there's a hole. This will be covered up by the bottom of the cockpit floor, so no worry there. CMK had tried to patch this in the master by adding a small layer of resin on top of where the hole is, but mine didn't completely form. Here's the gunbay side - you can see the hole near the bottom of the photo, and the small square patch that was likely added to the master. ^^^ This part's casting block was attached to the one side, the bottom would have been much more convenient, but that's just my way of saying I can't sand straight and I sanded part of the front bulkhead away. I laminated the end with styrene stock, sanded it to shape and we're good as new. The next part to be cut from its block was the firewall. 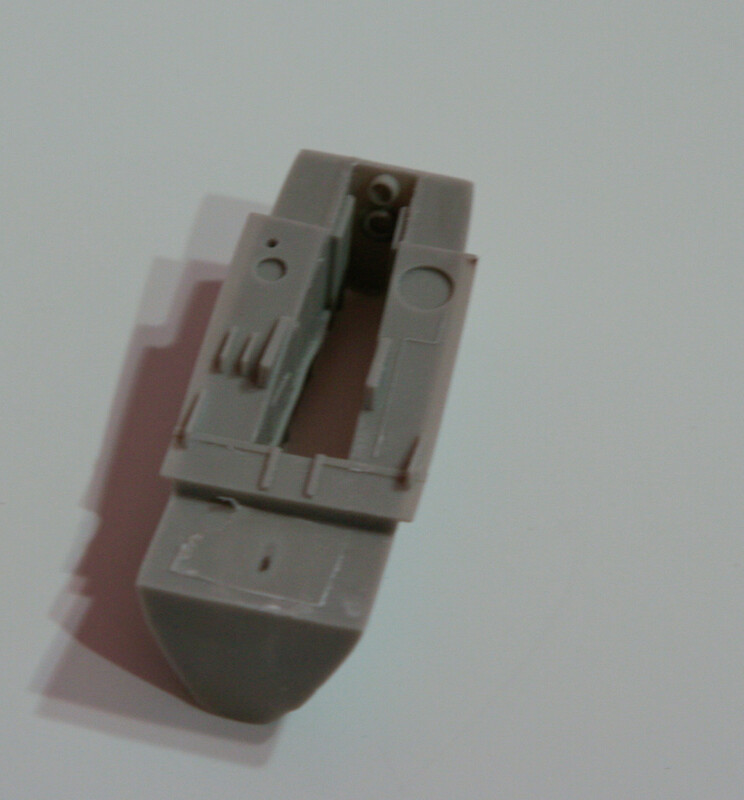 I interestingly noticed that the CMK part is actually a copy of the Special Hobby resin part - or vice versa because there is no need for the detail on the front of the kit part - the nose is closed and there's no propshaft to glue into that hole in the bulkhead. Like they always say - if it's not broke, dont fix it. Well, unfortunately this part arrived broken, but there's an upside; this type of modelling always involves scratch building, and I can't think of an easier part to start off with to boost confidence a bit! The last part I got to before the Missus returned home was the cradle for the oxygen tank. (the tank is the center piece on this casting block and the cradle is the rightmost part). Most resin parts have a small gap between the part and the casting block so you can saw there without risking damaging the part - this one didn't and since I can't sand straight, I actually chose to scratch build this cradle out of styrene. I blame all of Chuks threads for this. Actually - credit where credit is due, I wouldn't have known how to size and shape the circular parts of the cradle without his threads; drillbits! I just kept going until I found one that had the same circumference, then traced it onto styrene, made a crude cut with an xacto knife and finally used a round file. It fits the tank perfectly and it honestly took me less time than it would have to cut that block off and sand it down to the part. Well folks that's it for day 1. I haven't decided if I'm going to track time for this build - it may end up being depressing - but without the time spent with my nose in a book doing research, I have so far put in about 4 hours. I have also cut the panels out of the fuse for the gunbay in the D - but she aint pretty yet, so no photos so far. Does anyone have some photos of the gunbay? I'm looking for plumbing, wiring etc. There dont seem to be many photos kicking around except of the restored N. If no one has any then I'll just start making stuff up and no one will be the wiser. Speaking of interior green, doing Bell aircraft is something of a can of worms, as may be seen in this discussion. lol Jess - I was actually reading through that last night. I think I'm going to use euro dark green, but maybe now I'll use zinc chromate yellow (knowing full well that it's wrong) just to upset everyone. The same thing can happen with ships that disappeared under the waves 60+ years ago. People like to argue over the silliest things and they expect you to take notice of them. All the fun quickly goes out of models if you are constantly worried about stuff. 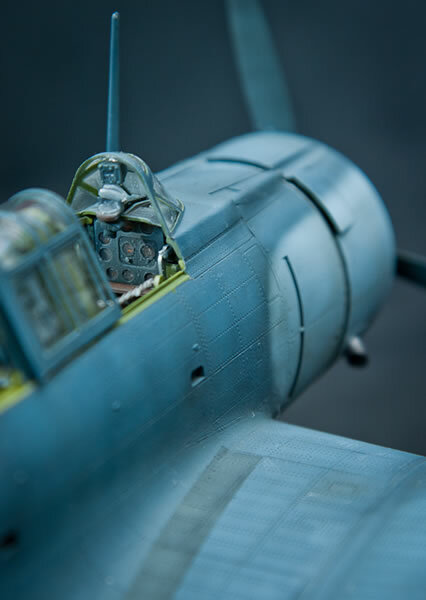 Am watching closely Sir as I have the Special Hobby 'RAAF Service' kit and the new Revell kit in the stash. This is coming along nicely and I'm wondering if I have the time to crack mine out and get it finished for Scale Modelworld in early November? Probably not so maybe for next year, but I'm thinking of maybe not having a trade stand as I miss that actual show doing that so then I might have the time to do it real justice and enter it into the competition? This is coming along nicely and I'm wondering if I have the time to crack mine out and get it finished for Scale Modelworld in early November? That depends Mal - if you're planning on building along, then which November were you thinking? This build is only progressing as quickly as it is because I'm off work sick for a long while - much like before when I returned to modelling, I love how easily it passes the hours and keeps me distracted. I got your email btw - I'll send the decals I have with my fiancee to work and have her scan them so we can get them to you quickly. I'm trying to source a better image for the D model we were discussing, but nothing as yet. Which reminds me - I meant to check for an aftermarket sheet for it this morning. The irony of buying a decal sheet to have stencils made up. I'll burn it afterwards as some sort of effigy to waterslide decals in general. To keep everyone else entertained - I'll toss in some photos of some of my previous works which were featured on Hyperscale. Just so you know what you're getting into. 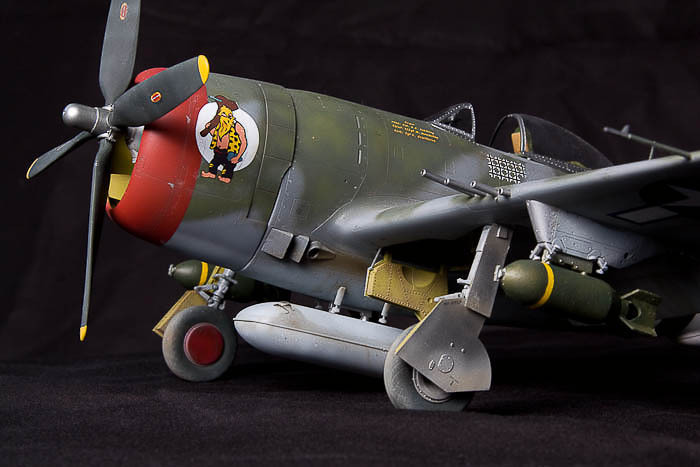 1/32nd P-47D - Markings provided by Miracle Masks, Hobby Decal Dry Transfers, Quickboost barrels and an Eduard P/E harness. 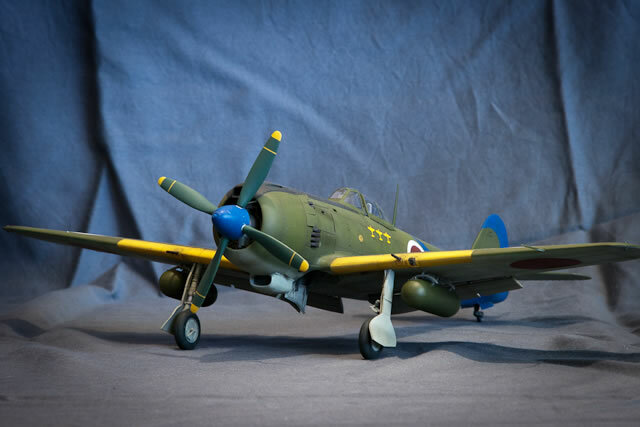 1/32nd Trumpeter SBD-5. The decals all bled after being left to soak overnight - I made my own masks for all of the markings and painted them, something I do regularly. 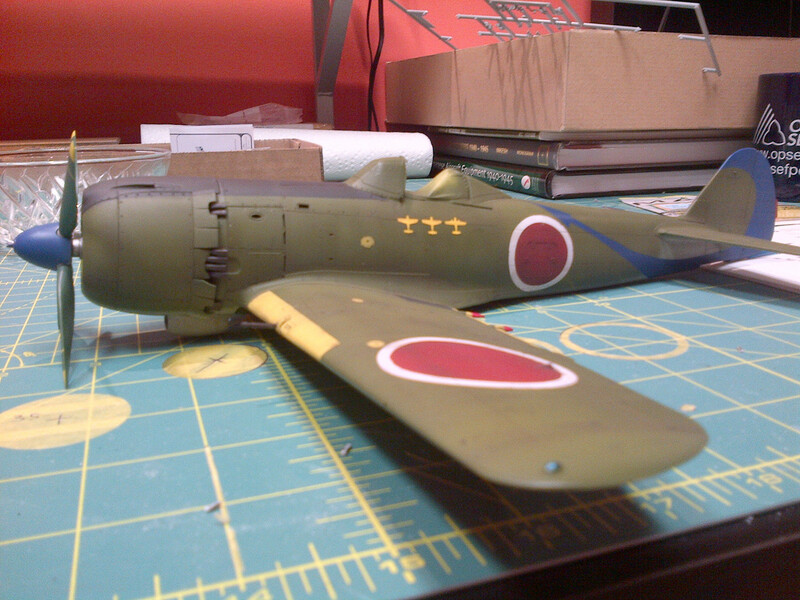 Lastly - my Hasegawa 1/32nd Ki-84. A stunning kit build with the Eduard colour photoetch interior set. 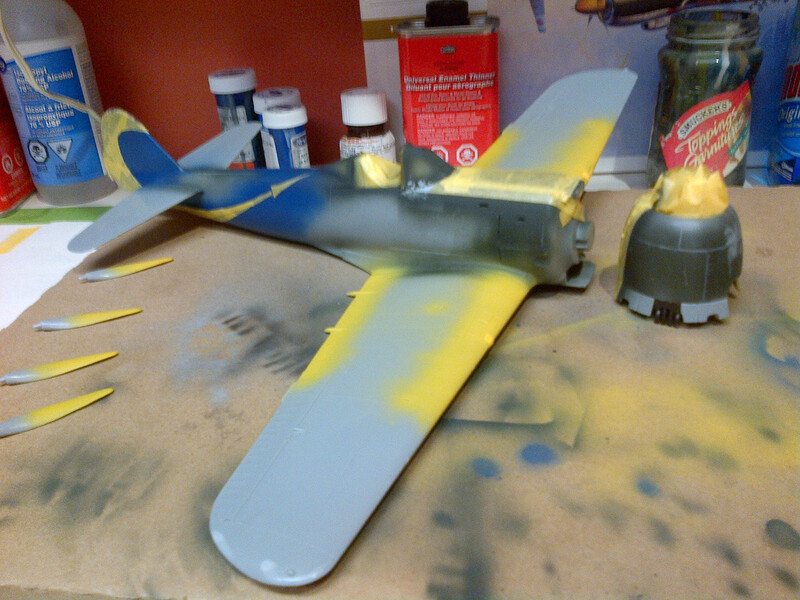 I knew the marking I wanted this plane in and actually had a decal sheet for it - but I didn't envy matching the tail decal to the spinner colour, so I used the sheet to make my own masks and painted all of the markings. Now to finish my coffee and get back to building! Mat, simply a great start. 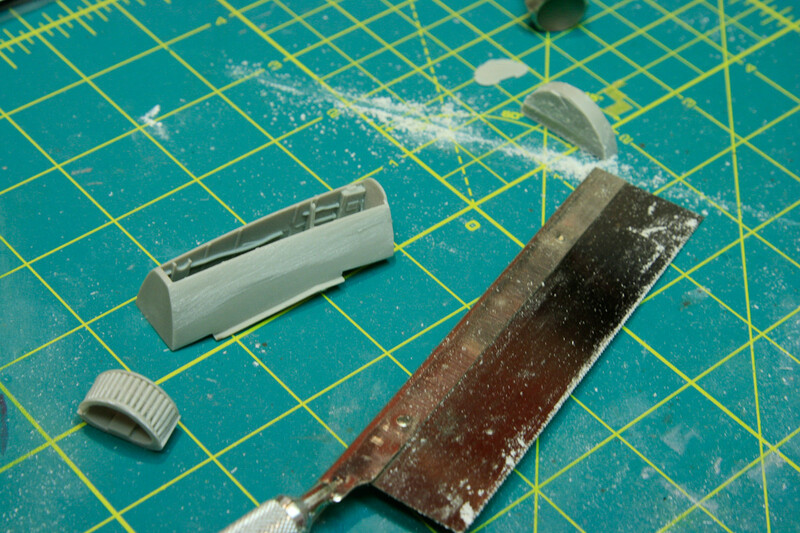 As for having to make broken parts out of styrene, I do it all the time. 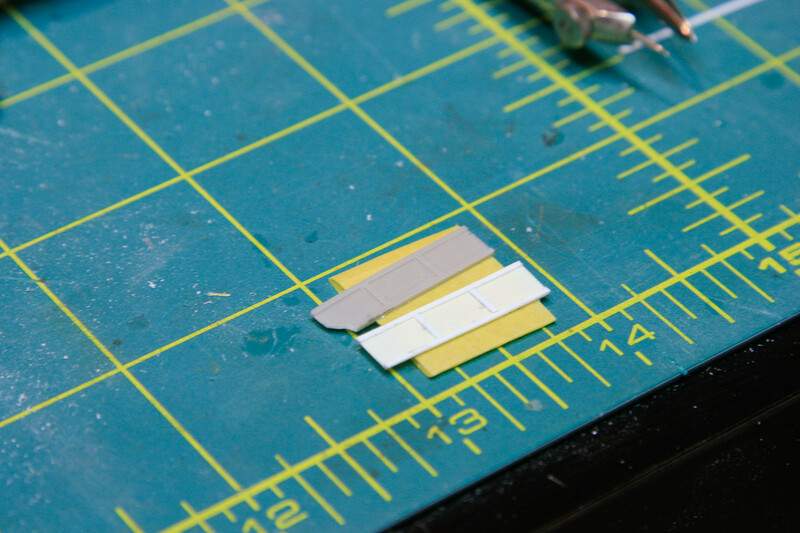 The parts end up being more to scale thickness as an added bonus. Both of the ones you made look great, especially the cradle. Nicely done. Matt you magnificent bastrd. That Ki84 is the real deal. Love the markings. You inspire me sir. 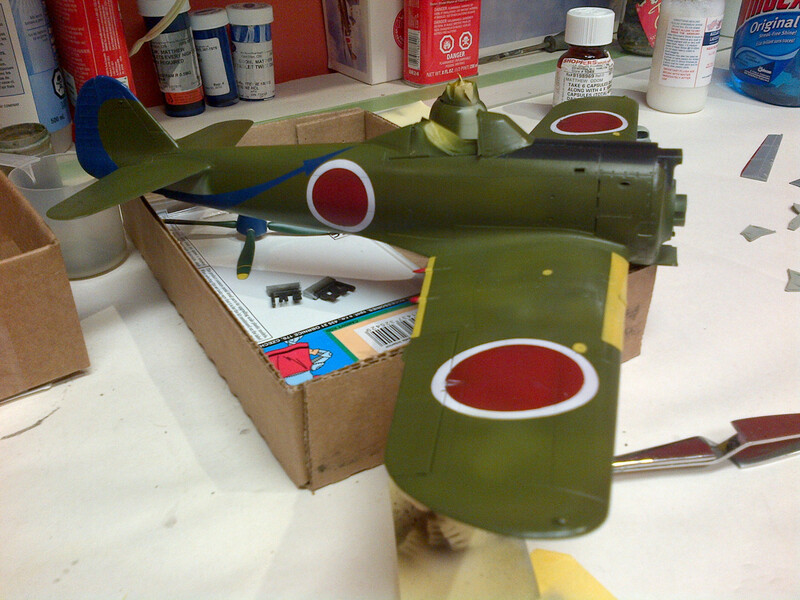 Was it really just a matter of tracing out tamiya masking over the decals with a sharp xacto? I'm following this build with great interest. Your take on Chukws' Girls.ummmmmmmm No comment. tidy and well organized rather, Bomb site is more apt. Waiting on the next installment. Thanks! I'm happy with how it turned out - and I'm so glad I went with the marking I wanted most, it couldn't have turned out any better. It more or less is a matter of doing that - but keeping in mind that I wanted to preserve the decals should things go cockeyed on me. 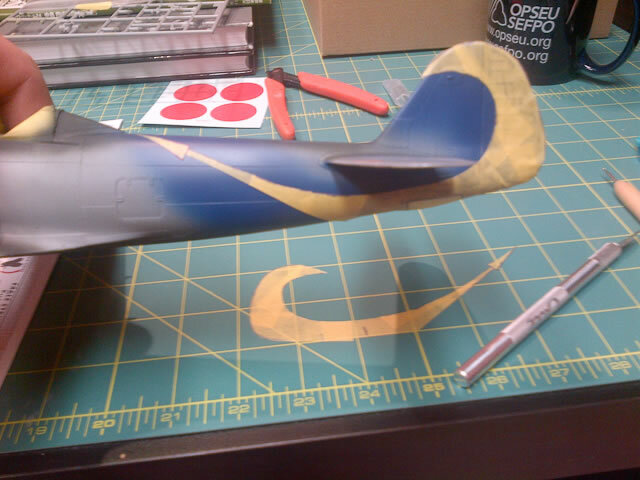 What I do is I tape the decals down to my model bench, then I tape down a piece of waxed paper overtop. I trace the decal onto the waxed paper. Once I'm satisfied with the tracing, I remove the decal sheet and layer the waxed paper with Tamiya masking tape. NOW I cut the tape - although sometimes it's best to trace the image again from the waxed paper onto the tape. From there life is easy - it's just about placing the tape onto the model using landmarks like you would with a waterslide decal. The best part is I still have the decal sheet intact at this point. I do as many markings as I can this way - I find it especially helpful with bands for the leading edges because the decals give you the shape that will conform to the kit, so you're not trying to place and then cut the masks like you would if you were masking the edges the conventional way. And - lets be honest, ID markings like that usually cross so many panel lines that I would never trust a decal to settle down properly. I've included some more photos that weren't featured in the article...just because I'm nice. (and I dont have many photos for this update, so I'm padding. 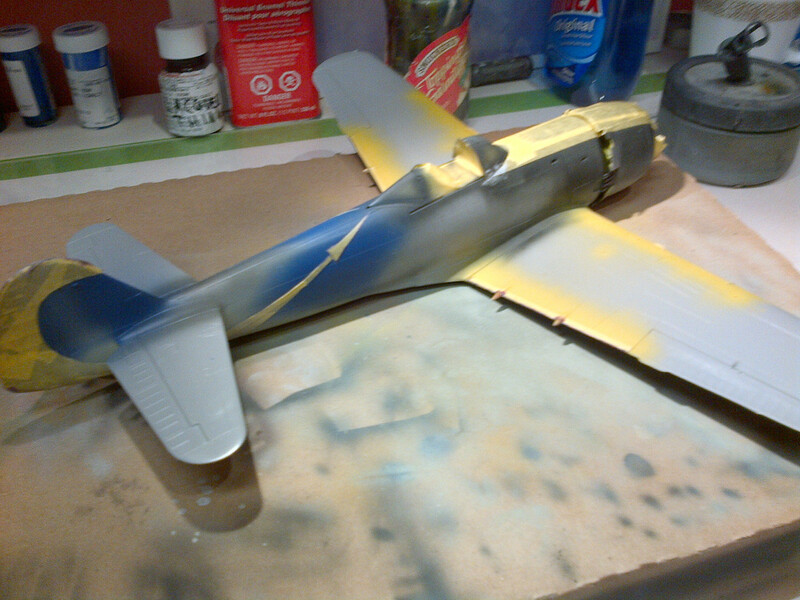 Tail and anti-glare stipe masked - leading edges painted and waiting for masking. Landmarking using panel lines and counting rivets is key to symmetrical masking. The best part - masks come off. For best success ALWAYS use a burnishing tool and burnish the edges of your masks. Only the kill marking was done by decal - with steady enough hands one could cut this into a mask as well. I painted the roundels because of the access hatch on this side of the fuse - it's recessed and very delicately engraved. The filler door was masked and painted last - Waldron punch for each end and a straight strip in between. Thanks Chris! I think my girl is quite beautiful - a mastery in her own right. Perhaps I'll name her after you. My model bench is only clean because I was switching projects. My models normally take months or years to complete, so when I'm done one I make it a habit to put every single tool away, change the paper on the airbrush table etc. That way in the ensuing chaos of starting a new build, I can find all the little parts I leave lying around during the initial steps. Otherwise my workspace is an organized disaster. 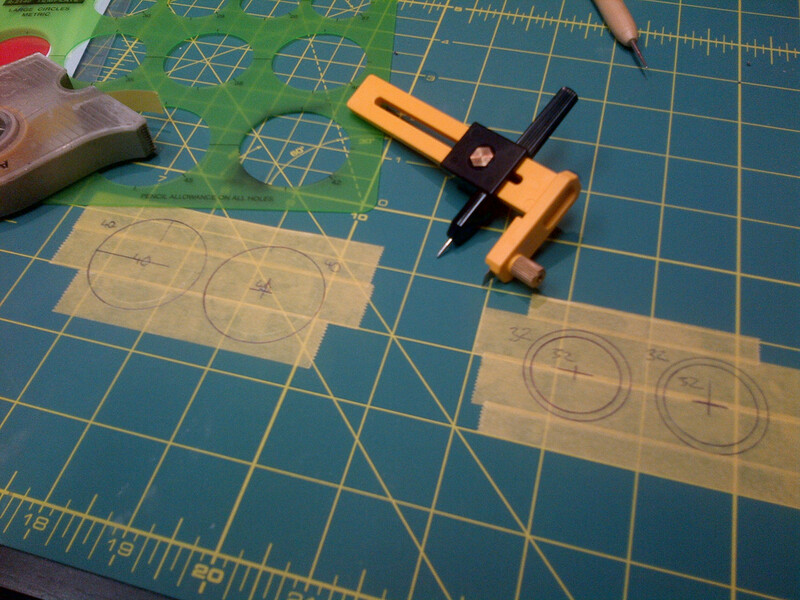 Not much to report - I wont bore you with photos of cutting parts of sprues, I know you're all well aware of how to accomplish this simple feat. I do have ONE photo to give you a bit of an update, we're making progress! The CMK instructions are pitifully bad, good references are a must. Matt, Thanks for the tutorial on masking. I'm getting to the point that even with the best of decals, there are times due to compound curves, doors, hatches, latches, handles, etc., where painting is the only viable way to go. 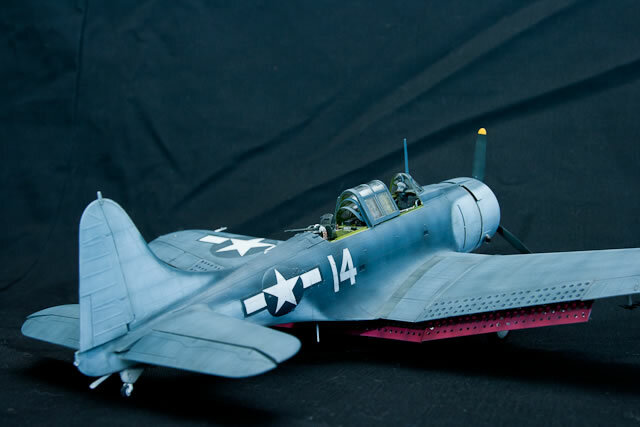 One small comment on your SBD-5 Dauntless, the center dive flap inside is painted red, it should be the same light gray as the bottom of the plane. 99% of the time guys model it incorrectly. 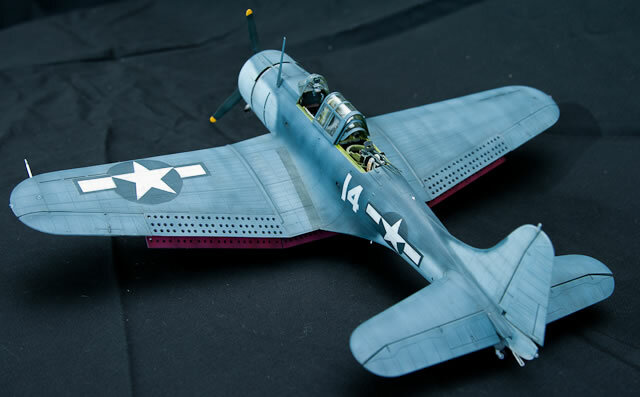 I only learned this a short while ago as I'm currently building a SBD-4, and doing research I came across several pictures both of models and the real deal where that dive flap was painted Gray. didn't know why, so I dug into the issue to verify it. Very interesting, Matt! I love your rendition of Air-A-Cutie- rrrrawrrr!!! 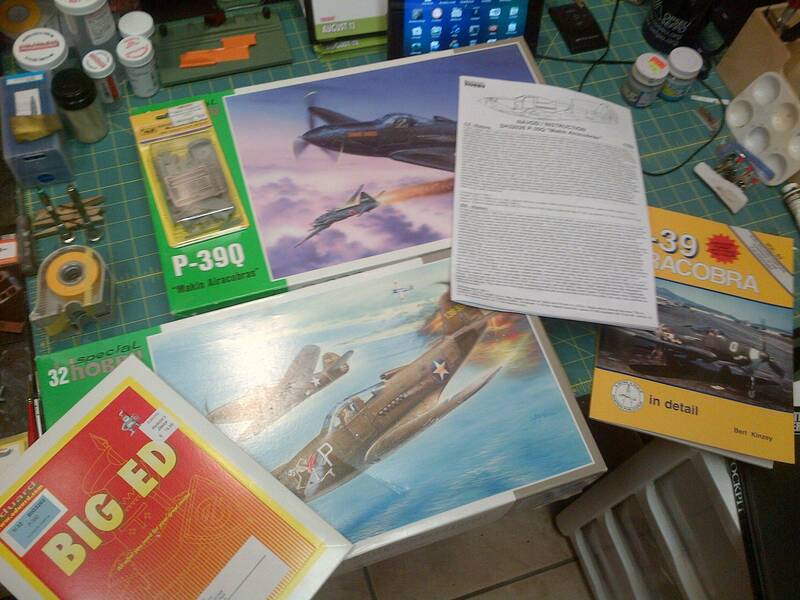 I'll be reading along- those brilliant builds you've posted are surely harbingers of two great p_39s to come. Love the masking SBS as well- cheers! There is apparently a shorfall of length in the tail. I'm glad you guys liked the brief masking tutorial - Mal you'll be pleased to know that's where my whole adventure started. the same roundels on the bottom wing of a Trumpeter Spitfire (I had a crappy old Techmod decal sheet, but was given a heads up before I used their decals) Those roundels are hard to do by hand on the best of days - the fact that they ran over a bulge on the bottom side of the wing only helped...me to swear a lot. For me the biggest advantage to painting the markings aside from not having to worry about them settling down, is the fact that I have so much more control over their weathering. I can completely screw them up and then just start over with a new coat of paint, as opposed to sourcing new roundels in the correct size etc. My biggest problem is that I typically forget to message Mal until I'm three days away from painting the markings or he's busing building a new cave. The nerve of the guy. Joel - Thanks for the heads up. 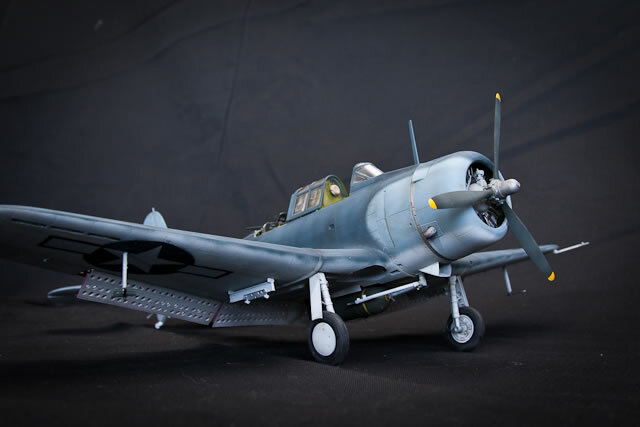 I actually had heard that before (my main area of interest is PTO aircraft) but this was one of those decisions that was a catch 22 - if you model it correctly, then everytime you show the model you spend ALL of your time explaining why you did this and the rest of your work on that kit goes unnoticed. Until you came along no one has picked up on it. Chuk - thanks for joining in! I'm glad you like her, but dont expect her to make a regular appearance, I fear for her safety - I dont want her pinned up on everyone's walls like your Frauleins. I'm sure it's a paternal thing. I'll have to pad my future posts with more previous builds - I always knew you put a ton of work into your threads, but I never realized how many things you pick up on when you upload photos and go 'hmmmm, well - I guess I'd better go tackle that problem I created'. I'm doing some problem solving currently, lots of head scratching but it's highly likely that I'll send you an email soon. Up until this build I have had horseshoes where the sun don't shine when it comes to aftermarket parts fitting. I guess that's because I have, as a law, avoided limited run kits and aftermarket together. Well folks, after my afternoon appointment, I'll start getting the interior green* parts from the second Airacobra off their sprues and cleaned up - then we'll start making some headway. *in no way intended to imply that I will paint the interior in US interior green, please put down the pitchforks and extinguish those fires. Matt, I've turned into a PTO guy myself. 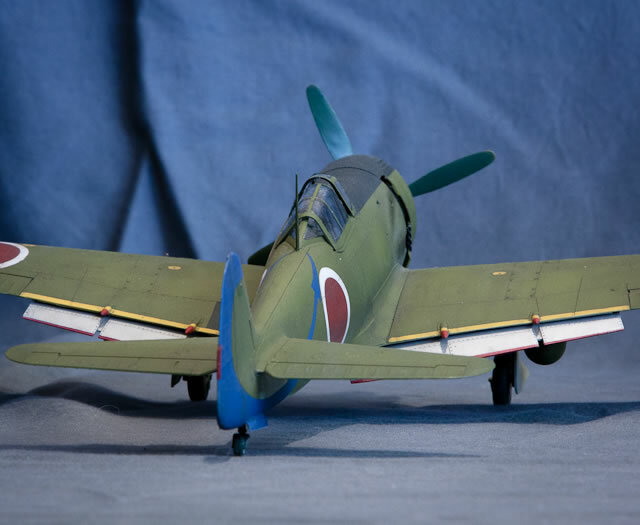 My future P47 and P51 builds will be PTO, not ETO.